Summary: The death of Judd Foxman's father marks the first time that the entire Foxman clan has congregated in years. There is, however, one conspicuous absence: Judd's wife, Jen, whose affair with his radio- shock-jock boss has recently become painfully public. Simultaneously mourning the demise of his father and his marriage, Judd joins his dysfunctional family as they reluctantly sit shiva-and spend seven days and nights under the same roof. The week quickly spins out of control as longstanding grudges resurface, secrets are revealed and old passions are reawakened. Then Jen delivers the clincher: she's pregnant. A few months ago, I reviewed ONE LAST THING BEFORE I GO by Jonathan Tropper, and I raved about the novel. I love the mix of poignancy and humor, and I pretty much knew that I'd found yet an author that would go down as one of my favorites. 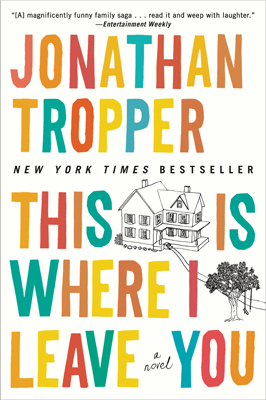 Then I heard from a few friends that if I enjoyed ONE LAST THING BEFORE I GO, then I just had to read THIS IS WHERE I LEAVE YOU because it's even better! I was positively giddy with the possibility! At its heart, THIS IS WHERE I LEAVE YOU is an extremely entertaining story about one very messed-up family that gets together to sit shiva after their father and husband dies. (It should be noted that none of the family, including the dead man, was a practicing Jew!) The story is told by Judd Foxman, a down-on-his-luck guy who has to return home after a few years' absence and make nice with his dysfunctional family. It's probably the worst possible time. Judd recently "walked in" on his wife and boss (if you get my drift), and his marriage and job are now in jeopardy. As the days pass, things definitely get heated between the various family members. Old secrets are revealed and long-time resentments rise to the forefront which put everyone on edge. However, things become even more troubling when Judd's estranged wife shows up and tells him that she's pregnant. THIS IS WHERE I LEAVE YOU is a wonderful look at all types of family relationships, and it will touch your heart and make you smile. I loved, loved, loved everything about THIS IS WHERE I LEAVE YOU; and as a result, I'm afraid that my review won't be worthy of this book's greatness. Mr. Tropper is definitely one of the best modern-day writers that I've ever read. Not only is his prose stellar, but his dialogue is terrific too. And don't even get me started on his outstanding ability to blend touching moments with really funny ones. He has mad skills! But what I really appreciated about THIS IS WHERE I LEAVE YOU is how well it explored the ups and downs of families. There is no doubt that the members of this family weren't always likable, nor did I agree with many of their actions; however, I did find them to be quite endearing -- much in the same way I feel about members of my own family. I loved how this book delved into the complex dynamics between parents and children as well as the ones between siblings; and I thought the author was spot on in his portrayal of jealousy, resentment, guilt, acceptance, and forgiveness. This book was so insightful and gave me so much to think about; and I think that's one of the best things I can say about any work of fiction. I wasn't surprised to learn that THIS IS WHERE I LEAVE YOU is being made into a feature film with Mr. Tropper writing the screenplay. The cast is pretty darn impressive and includes Zac Ephron, Jason Sudeikis, Jason Bateman, and Goldie Hawn. I can so see them portraying these crazy characters! I'm not much of a movie-goer, but I can assure you that this is one movie that I won't miss. It's not my turn for quite awhile to host my book club; however, THIS IS WHERE I LEAVE YOU is definitely going to be on my short-list. I am almost positive that everyone in my group will adore this book (and that matters to me whether it should or not!) There is a reading guide available with ten fantastic questions, and I love that most of the questions are so relevant to readers. Some of the topics you might want to explore include marriage, family dynamics, betrayal, secrets, resentment, parenting, grief, infertility, and faith. Overall, THIS IS WHERE I LEAVE YOU is one of the best books that I've read this year. Heck, there's a very good chance that it will be my very favorite! Highly recommended! I totally agree with you about this book! And what a great choice in Goldie Hawn! Can't wait! Wow, I can tell how much you loved this book. I've heard several authors rave about it too. Sounds like one I need to read. Sorry I didn't enjoy it as much as you. One day I will pick it up again. Thanks for your review. You sold me! Just pinned it to the list of need to reads! Your comment on the author having "mad skills" was too funny! I had never heard of this book but after reading your review I have to check it out. Holy cow ... if you love it so much then it's going on my list. Terrific review, Julie! Sounds like a great book! And the one before it. Why have I not heard of Jonathan Tropper before? Wow! Okay, okay ... I'm going to find my copy. My book club read this last year and we all loved it - it is a good book club pick. I didn't know it's being made into a movie - thanks for sharing that info! Agree that this was much better than OLTBIG. I think this is his best.